Proc Natl Acad Sci U S A 2012 109(27):E1848-57. CHIR-99021 (CT99021) HCl purchased from Selleck. Gpc4 regulates ESC response to Wnt/β-catenin signaling. (E) Quantitative analysis of control and Gpc4-mutant beating foci exposed to the GSK3 inhibitor, CHIR 99021 (1 and 3 μM, from day 0 to day 5). Analysis was done at different time points. Gpc4- mutant cells treated with CHIR 99021 behave as controls (mean±SEM; n=2). Stem Cells 2012 30, 1863-1874. CHIR-99021 (CT99021) HCl purchased from Selleck. Characterization of rES cells. A: image of normal rES cell colonies on feeder layers. B: rES colonies were positive for AP staining. CeE: rES colonies readily expressed pluripotent markers, Sox2 (C), Oct4 (D), and SSEA-1 (E). Blue, DAPI. Scale bars: 100 um. J Genet Genomics 2012 39, 643e651. CHIR-99021 (CT99021) HCl purchased from Selleck. Inhibition of GSK3 activity induces an autophagic response in human pancreatic cancer cells. PANC1 cells were treated for 24 h with DMSO, CHIR99021 (CHIR; 5 uM) or the mTOR inhibitor Torin1 (250 nM). Autophagosome (punctate LC3B) (D) and lysosome (E) labeling was visualized with a Zeiss LSM700 confocal microscope. Images were acquired with a 20x (D) or 63x (E) objective. Nuclei were stained with DAPI. Scale bars, 20 祄.
J Biol Chem 2015 290(9), 5592-605 . CHIR-99021 (CT99021) HCl purchased from Selleck. A. Vero cells were pretreated with the indicated concentrations of CHIR-99021 for 1 h and then infected with PEDV (MOI = 1) for 8 or 10 h. Cell lysates were prepared and analyzed using Western blotting. PLoS One, 2016, 11(8):e0161508. CHIR-99021 (CT99021) HCl purchased from Selleck. 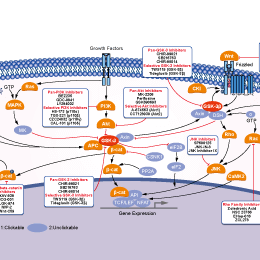 Smad linker phosphorylation involves GSK3 in human melanoma lines. 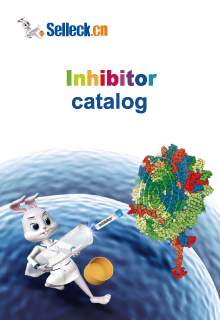 Inhibition of Smad2 and Smad3 linker phosphorylation in the presence of the specific GSK3 specific inhibitor, CT99021. 24 hours post seeding, WM793 and 1205LU cells were serum-starved for about 16 hours, and incubated in the absence (2) or presence (+) of 2 uM of CT99021 for two hours. Immunoblots were performed as in A. p: Phosphorylated. S: Serine; T: Threonine. PLoS One 2012 7, e47312. CHIR-99021 (CT99021) HCl purchased from Selleck. SKOV3/DDP cells were treated with a range of concentration of (A) CHIR-99021 or in combination with 20 µM cisplatin for 48 h.
Exp Ther Med, 2016, 12(6):3851-3858. CHIR-99021 (CT99021) HCl purchased from Selleck. PANC1 cells were treated with GSK3 inhibitors SB216763 (SB 10µM or SB 20µM) or CHIR99021 (CHIR 5µM) for 72h. CHIR-99021 (CT99021) HCl purchased from Selleck. Activity of canonical WNT/ β -CATENIN signals induced by CHIR 99021 in the developing human lung. Human lung tissue explants obtained at 15 weeks of gestation were exposed to 0, 5 and 10 μM CHIR 99021 in vitro for 72 h. (A-B) Western blot analysis showed expression of β -CATENIN in human lung tissues. Results are presented as the mean ± sem of three independent experiments. *P < 0.05, **P < 0.01. (C) qRT-PCR analysis detected a dose-dependent increase in WNT signaling transcription factors and target genes following exposure to CHIR 99021. Results are presented as the mean ± sem of three independent experiments. *P < 0.05, **P < 0.01. (D-K) Histology examination showed obvious morphogenetic changes of the airway epithelial cells associated with CHIR 99021 treated lung tubes. Scale bars: D-G =100 μm; H-K = 20 μm. Ring DB, et al. Diabetes, 2003, 52(3), 588-595. Bennett CN, et al. J Biol Chem, 2002, 277(34), 30998-31004. Mussmann R, et al. J Biol Chem, 2007, 282(16), 12030-12037. I recently purchased CHIR 99021 to inject mice intraperitoneally. The data sheet says using 10% captisol for in vivo use. Is it for IP injection? Or do you have other solutions to suggest to use for in vivo IP injection of CHIR 99021? The formulation of 15% Captisol is for oral gavage, and S2924 CHIR-99021 (CT99021) HCl in it is a suspension. S2924 CHIR-99021 (CT99021) HCl can be dissolved in 5% DMSO+30% PEG 300+ddH2O at 24mg/ml as a clear solution for IP injection. How about the half-life of this compound? If it is necessary for daily treatment when the compound is used in long-term experiment? Please change the culture medium each day to add the new comound in it if the duration is more than 72h. What is the difference between S2924 and S1263? Which one is better for differentiation? S1263 is the free base format of Chir-99021, while S2924 is the HCl salt format. They have the same biological activity but are slightly different in solubility. TWS119 : GSK-3β-selective, IC50 of 30 nM. CHIR-98014 : GSK-3α, IC50=0.65 nM; GSK-3β, IC50=0.58 nM. Tideglusib : Phase II for Alzheimer's disease. AZD1080 : Orally active, brain permeable GSK3 inhibitor, inhibits human GSK3α and GSK3β with Ki of 6.9 nM and 31 nM, respectively.